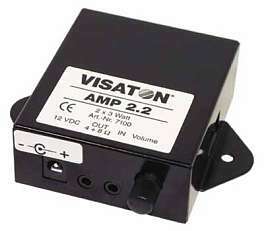 For you Visaton Subwooferwe recommend different amplifiers e.g. Hypex moduls. the 75 x 97 x 28 mm modul contains 3,5 mm-stereo sockets for input and output. A level control allows to adapt the output power. Tha modul can be connected to a PC sound card or an MP3-player with low level output. You need a power supply with 12V or you can use the 12V supply of your PC.